★★★★ The Guardian Hot on the heels of the RSC’s hugely enjoyable Much Ado set in 1950s Cuba comes another really cracking production, this time transposed to 1930s Sicily. Director Andrew Hilton is Shakespeare’s plainest cook, but he allows himself and his cast plenty of fun, as well as more scenery than usual – a few tables, chairs and Chinese lanterns. The Morning Star For the seasonal duo of plays for his Shakespeare at the Tobacco Factory Company, Andrew Hilton has coupled his acclaimed production of Othello with what is often seen as Shakespeare’s schizophrenic comedy. So often on the stage, there appear to be two conflicting modes of comedy at play. The romantic main plot, in which malignant plotting to destroy the happy union of young lovers is only foiled by the lucky interference of comic cops, is virtually always overshadowed by the so-called merry war of words between two nominally secondary characters, Beatrice and Benedick, significantly played in most productions by the lead actors. Hilton has resolved this apparent broken-backed aspect of the play by presenting a coherent world, here 1930s Sicily, where characters inter-relate across class and gender with traditional familiarity. In this close community, the old regard the young with humorous warmth, having seen it all and lived it themselves before. 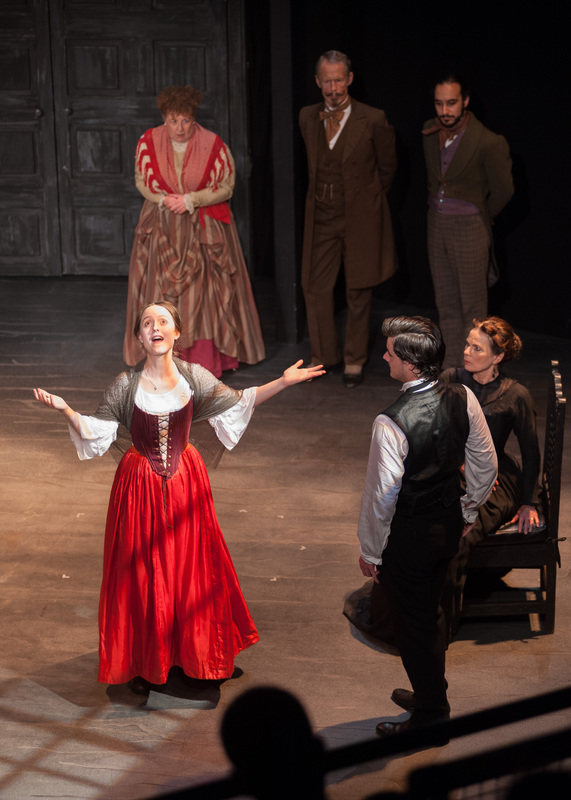 Both Lucy Black’s Beatrice and Jay Villiers’ Benedick, pushing a resigned middle age, reveal a pained awareness of the passing of youth behind their bouts of rapier wit as they contemplate the engaging puppy love of Siobhan McMillan’s Hero and Oliver le Sueur’s Claudio. As always, Hilton’s great strength lies in his semi-permanent ensemble. The test of this play comes in the crucial wedding scene, when Claudio is misled to believe that Hero is unfaithful and rejects her with a cruelty that can tip the action into melodrama. Here, Beatrice’s stark demand of Benedick to “kill Claudio” is delivered with a low-keyed helpless intensity that strips away all the hitherto surface gaiety. We recognise now their rooted mutual feelings, which hardly needed the well-intentioned trickery of their friends to trigger them. The comic identity of the play is subsequently retrieved by Bill Wallis’ Constable Dogberry, no comic clown but a man whose mangled language reveals a life of frustrated ambitions and pretensions. 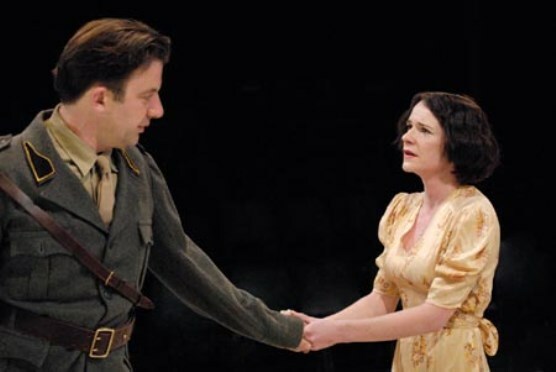 The thematic links between Othello and Much Ado – despite their wide difference in tone – are compelling: each play turns on a misapprehension of sexual deceit, each of these malevolently inspired. But whilst for a mighty tragedy one great linear plot is sufficient, for the lighter, more playful comedy Shakespeare deftly weaves in two. While Don John works to destroy one love-match – by tricking Claudio into believing that his fiancée, Hero, is a whore – Don Pedro works to create a second, by tricking Benedick and Beatrice into believing that each is silently in love with the other. Little is as it seems in this play – the masks, the hiding places, the truths misheard as falsehoods, the falsehoods misheard as truths, these are the currency of communication in Leonato’s house, and they find an apt mirror in Dogberry’s infectious malapropisms. But amid all the chaos, we may well suspect that there lies one delightful psychological truth – that Don Pedro is not so much ‘creating’ a love-match, as revealing one that has been hidden from everyone, even from Beatrice and Benedick themselves. The ugly crisis in the first plot – the extraordinary denunciation in the church – then becomes the catalyst of the resolution in the second. Truth is provoked by the enormity of the Lie. Pretension, self-absorption and brittle self-esteem give way, in the pressure of the moment, to a naked simplicity. We have chosen to set the play in the Sicily of the 1930s, a world with one foot in the conservative and Catholic world that Lorca explored so powerfully in neighbouring Spain – and the other in the freer world we know now. As the dual plots approach their crisis, the older world claims first Claudio, Don Pedro, Hero and Leonato and then – in the famous ‘kill Claudio’ injunction – Beatrice and Benedick as well. 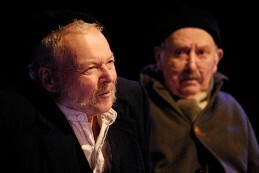 How far the final resolution can reverse that claim is the most lasting and intriguing question about the play. The story of Hero and Claudio – the disgracing of an chaste woman – has been a staple of romantic fiction and can be traced back to a fifth century Greek tale, Chaereas and Callirrhoe, and to the story of Susanna and the Elders in the Biblical Apocrypha. There are many Renaissance versions including in Ariostos’s ‘Orlando Furioso’ (1516, translated into English by Sir John Harrington, 1591), and Matteo Bandello’s ‘Novelle’ (1554, adapted into French by Belleforest, 1569). We believe that Shakespeare himself created the characters of Beatrice and Benedick, though the tradition of lovers using verbal sparring as an expression of sexual attraction was well established and Shakespeare had already explored it in Love’s Labour’s Lost and The Taming of the Shrew. The overhearing device to bring Beatrice and Benedick together may have been inspired by a passage in Castiglione’s The Book of the Courtier (translated by Sir Thomas Hoby in 1561). It is generally assumed that Much Ado About Nothing was written in either 1598 or 1599. In 1600 the play was registered with the Stationers’ Company, and was printed later that year in the only early Quarto version. Using the quarto copy as the source, the play was printed again in the First Folio in 1623. The title page of the 1600 Quarto announces that it was ‘sundrie times publikely acted by the right honourable, the Lord Chamberline his servants’. We have no reason to doubt this claim – or Leonard Digges’ assertion in 1640 that it was enormously popular with playgoers – but firm records of early performances are actually very scarce, the first of these being in 1613 when the play formed part of the celebration for the marriage of James I’s daughter, Elizabeth, to Prince Frederick of Bohemia. After the Restoration in 1660 the play was assigned to Sir William Davenant and his Duke of York’s Company. Davenant chose to create a hybrid of the play with Measure for Measure, entitled The Law Against Lovers. It suffered other such treatment well into the eighteenth century but was revived intact at Lincoln’s Inn in 1721 and in 1748 was first taken up by David Garrick who became a famous Benedick, playing the role every year until his retirement in 1776. There then follows a list of most of the famous names in British Theatre – Sarah Siddons (in Bristol), John, Charles and Fanny Kemble, Helen Faucit, Henry Irving, Ellen Terry, Herbert Beerbohm Tree, Sybil Thorndike, Lewis Casson, Edith Evans and John Gielgud – all identifying the story of Beatrice and Benedick as one of the most relishable vehicles for leading actor and actress. In the post-war theatre Gielgud played Benedick again, first with Diana Wynyard, then with Peggy Ashcroft; Zeffirelli directed it for the National Theatre with Robert Stephens and Maggie Smith; to be followed by RSC productions with Janet Suzman and Alan Howard, Judi Dench and Donald Sinden, Derek Jacobi and Sinead Cusack, Harriet Walter and Nicholas le Prevost and – most recently – the Marianne Elliott production at the Swan Theatre with Tamsin Greig and Joseph Millson. Common to many of these later productions has been an updated setting, from Zeffirelli’s late nineteenth century ‘Mafia’ Sicily, to Marianne Elliott’s pre-revolutionary Cuba.